Baked Luckycat named “neko (cat) yaki (bake)”! I think they were born maybe because Sakura Bakery is in the　Gotoku-Temple around. Gotoku-Temple is famous for Luckycat! 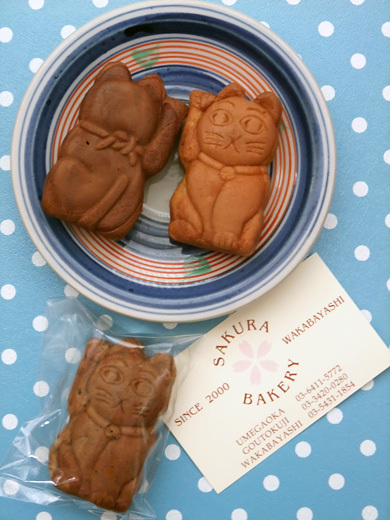 Red bean paste, sesame and red bean paste, or chocolate is inside for each cat. Not only the front of the sweet, their back is really cute too! Oh those cats looks cute, actually reminds me of those gold cats in chinese shops sold as souvenirs with their little neck-bells. Love the flavours too! Just went on to their website, love it!